Being Healthy isn't just about going on that 5 mile run or eating that salad. Being healthy starts with you and what's within you. I truly believe that having a good exercise plan and eating clean is the easy part; I mean really, if you have a negative outlook on yourself and the world around you then you have a cluttered mind and spirit. When you have a cluttered mind and spirit, if affects how you feel about exercising and you'll want to eat that comfort food that's oh so bad for you. but oh so tasty. From personal experience, I have discovered that most of us aren't healthy in mind body or spirit because we are too focused on how healthy those around us are. Envy is a monster, I'm telling you. It's so sad to think that we started off as innocent children just wanting to run around and play with our friends to wanting to run (physically) in order to gain the acceptance of friends. Or on the other side of the spectrum, we set out on a journey to become more so that others look less. Does that make sense? Let me say it again, We want to become MORE so others look LESS. And that's just how the world is now a days, which is a pity. We are always so worried about what the next person is doing and why their grass is so green compared to our patchy dead grass. But what all of us need to remember, is that "Comparison is the thief of Joy." So while we are off looking at others lives and trying to figure out a way to be MORE than them we end up losing our own happiness. We end up feeling LESS about our lives. But the truth is, everyones lives are different. and most of the time what we see in others is a completely different story than what is really going down on their side of the fence. Their oh so green grass is probably artificial. It's probably an illusion. And if it's not, if it truly is green grass, well we should be happy our neighbors (aka those around us) are keeping their grass looking so good. Right? Right! As human's who have many flaws, we will always be searching for that "Greener Grass." 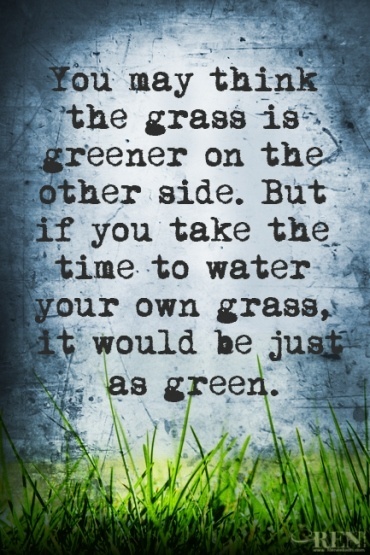 But today, I challenge you all to stop searching for that green grass and start watering the grass that is in front of you. (not literally because california is in a drought) Work on turning that Grass into a Garden, a beautiful garden that is filled with peace, happiness, and love. I promise you that you will be filled with SO MUCH MORE than you could ever imagine. The moral of this story, is to focus on yourself. Focus on your well-being and seek your own happiness. If we all spent more time focusing on our own grass just think how green it could be.